It’s casserole season! Time to spend a little more time in the kitchen, time for potlucks and gatherings, time to sit in front of the TV watching Little House On The Prairie reruns and eating an entire casserole by yourself, am I right? The original inspiration for this was my boyfriend’s description of Scalloped Potatoes and Ham. Not something I ever had as a child, but I can see the appeal. Cream of celery soup, tender layers of thinly sliced potato, browned on top, what’s not to love? Well, besides that ham. 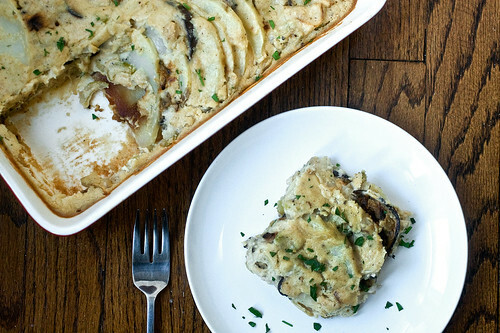 This casserole is creamy, dreamy, rich and made smoky with the addition of Eggplant Bacon. I actually see a world of possibility here…swap the potatoes out for root vegetables or sweet potatoes, add roasted red peppers or fennel, use tempeh bacon instead; this casserole is your template! And if you’re simply just searching for a perfect scalloped potato recipe, this might be it, so go ahead and leave the bacon out. These would be perfect for any holiday table, or anywhere mashed potatoes would be appropriate. The key to perfectly cooked potatoes is to slice them thinly – aim for between 1/8 and 1/4 thick. And seal the casserole in tinfoil until potatoes are easily pierced with a fork, then (and only then) do you uncover the casserole to let everything get nice and brown. ~Slice the potatoes when the onions are cooking, that way they don’t turn brown while you’re waiting for everything else to be ready. ~You can actually use roasted cashews here if you like. I usually use unroasted to make cashew creme, but I was out of it and the roasted ones worked just fine! ~If you’re making the eggplant bacon, this will take considerably more time, so add 30 minutes to your cooking time. ~If you’re looking for a gluten-free option, I love to make breadcrumbs out of gluten-free pretzels. You can also sub the breadcrumbs with 2 tablespoons cornstarch. ~If you don’t have a rectangular 2 quart casserole, square will work, too. Place the drained cashews and vegetable broth in a food processor and blend until completely smooth, scraping the sides of the food processor with a spatula occasionally to make sure you get everything. This could take 5 minutes. In the meantime, preheat a large pan over medium heat. Saute the onions and celery in the oil, along with a dash of salt. Cook until onions are nice and brown, about 10 minutes. Add the breadcrumbs and toss to coat onions and celery. Cook until the breadcrumbs turn a few shades darker, about 3 minutes. Now is a good time to preheat your oven to 350 F.
Pour the cashew mixture into the pan and lower heat a bit. Mix well. Add lemon juice, several dashes black pepper and salt. Let cook for 2 minutes, it should begin to thicken. Taste for salt and adjust seasoning if needed. Now we’ll put this baby together! Lightly spray a 2 quart casserole rectangular with cooking spray (or lightly grease with olive oil). Pour half of the sauce into the casserole. 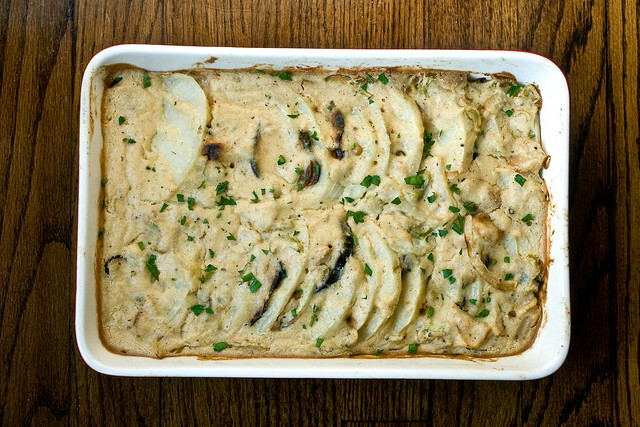 Now arrange potatoes and eggplant into the casserole, dredging potatoes in sauce a bit as you layer. They should be in slightly overlapping layers, with a slice of bacon in between each potato. Pour the remaining sauce over the potatoes. They should be mostly submerged. Use a rubber spatula to spread the sauce on if needed. Seal tightly with tin foil and bake for about 45 minutes, or until potatoes are easily pierced with a fork. Remove foil and bake for an additional 15 to 20 minutes, until nice and brown. Garnish with fresh chopped parsley and serve! Aaaaaaaaaaaoooooooooh, that looks sooo amazing!! This reminds me a bit of Moussaka, I will definitely give it a try! Oh I cannot wait for these. My CSA has been pumping out the potatoes and I have an old-style crank slicer/grater that creates perfectly even potato slices (thanks, Mom who recognizes the importance of scalloped potatoes and is better at eBay than I am). Thanks Isa!! OMG this looks RIDICCCCCC. Eggplant is my favorite vegetable on the planet (as seen by my numerous recipes on my blog) but this takes the cake. You da best!!! Wow, that looks seriously amazing! I might have to try to find the time to make this before MoFo’s over! My sister and I were just talking about scalloped potatoes and ham. I never liked my mom’s because she used velveeta and the sauce would always break so it was potatoes and ham with curdled cheese sauce. So I look forward to making this version. I made your scalloped potatoes recipe from VWAV one year for Thanksgiving and totally freaked out over the slicing of the potatoes to 1/4-1/8 inch. I brought my plastic Garfield ruler into the kitchen. Haha, yeah, I think it’s not a bad idea to measure once, but the more you prep stuff the easier it is to gauge the thickness without measuring. We have Appetite for Reduction and we make the eggplant bacon a lot! Yum! I love the idea of it with scalloped potatoes. Mmmm!! You seriously are a mind reader! I just made a scalloped potato recipe last week… I (am pretty sure that I) invented pumpkin scalloped potatoes. I used russet and sweet potatoes and used a roux, almond milk, pumpkin, nutmeg, cinnamon, garlic, onion, and other yummy stuff to smother it in. I love that idea! So the pumpkin was pureed in the bechamel? The minute this went up I made it. You would think my son had never had a potato in his life the way he ate this. Wonderful recipe. I am already planing on taking this to the Thanksgiving potluck this year. Recently diagnosed as Lactose and Soy intolerant. Its great to find a creamy recipe I can enjoy. Sunday dinner will be scalloped eggplant and bacon. I am confused! What do I do with the onion/celery/breadcrumb mixture? Is it combined with the cashew mixture in the saucepan? Yes, the cashew creme goes into the pan with the mixture. It says “Pour the cashew mixture into the pan and lower heat a bit.” Is that confusing? Maybe because in the interim the oven is being preheated? I was also a little confused whether the pan I would pour the creme in was the pan that had the onion, etc, but after reading further down the recipe and finding no more mention of the onions on their own, assumed that had to be the one. Maybe just edit to say “Pour the cashew mixture into the pan with the onion, celery and breadcrumbs.”? but the potatoes were so creamy and perfect! FAB-U-LOUS! just plain – no eggplant bacon – and it was outstanding! I can’t wait to make the eggplant bacon!! I made this and it was absolutely delicious! I couldn’t have enough. And when my husband took his first bite, he paused and his eyes bulged out of his head … that’s how good it was. The eggplant bacon is so good I could hardly believe it. I had to make a second batch because I kept eating them while prepping the rest of the recipe. I used Bragg’s instead of regular soy sauce and it was wonderful. Isa, all I have to say is: I have been cooking vegan for 9 years now and I was getting tired of the same old same old. A friend has a couple of your books and recommended your blog to me. YOU are revolutionizing my kitchen! You rock and you are sick (in a good way)! Every time I taste one of your concoctions, I am filled with indignation because it tastes so good that NO animal should EVER have to be used for consumption in ANY way. In light of your deliciousness, using animal products for human consumption is absurd! Your vegan food knocks every animal-based meal out of the park. There, I’ve said it. Whoa, easy there! We don’t want eyes bulging out of heads. Have you been spying on me or does everybody watch Little House and consume large quantities of casserole? That looks amazing! Out of this world good! I forgot to get an Eggplant, so used a box of pre-breaded frozen Eggplant slices for the “Bacon” and left out the bread crumbs in the sauce. One of the best casseroles I’ve ever. Made this last night for dinner and it was amazing! I am not usually a fan of “cheezy” or creamy sauces, but I always loved scalloped potatoes–this sauce is incredible! And so easy to make. I took a few liberties with the recipe–I didn’t have a yellow onion or celery, so I used 3 leeks instead, and I made tempeh bacon from the Vegan Brunch cookbook in place of the eggplant bacon. I also threw in some broccoli just because I had to use it up. It was outstanding! Thanks Isa for yet another delicious recipe. And this is going on my “must make now” list! Amazing. Wow this looks incredible! i thought cashew cream was so much harder than this, must make! Looks incredible! I want to make this for Thanksgiving, but I would have to make it ahead of time. How does it taste the next day? Can you assemble a day in advance and just bake the day of? Mine was still yummy the next day, but a little dry. The other thought I have is to add maybe 1/2 cup extra broth to the sauce to make it extra saucy. Oh boy. I’m going to have to make this. A lot. Sooooooo delicious! I accidentally forgot to add the breadcrumbs and the sauce still thickened up just fine after the lemon juice, and it was still creamy and delectable the next day, so maybe consider that if you’re making it ahead of time. Yum! I made this yummy dish. The eggplant got “lost” and the sauce was a little too thick. I’m going to make it again and I’m going to add a half cup or so of stock. I really LOVED the flavor!! Okay I had a couple issues making this. 1) My eggplant didn’t get crispy at all – it’s supposed to get a little firm/crispy, right!? My pieces were all floppy, even after baking longer than recommended. 2) I had 2 lbs of potatoes, 3 potatoes total. I only had room for two! 3) Related, after laying down my potatoes and eggplants I barely had enough sauce to cover the top. The recipe said it should be submerged. I feel like somehow the ratios are weird or something because I’m confident I followed the directions to the letter, though next time I would only buy 2 potatoes, and make half again as much sauce to cover everything. Oops, looking at your photos I think I used a deeper casserole dish than yours, which might explain the weird ratios. Derp! And FINAL comment (I swear!) this turned out incredibly delicious! INCREDIBLY! My boyfriend, my two roommates, and my visiting friend (all omnivores) said it was great and ate it up. Thank you so much! Great! Thanks for letting me know. You’re probably right, it will get soggy, so make it the day before and ignore me. This recipe is amazing! Like Meg, my omnivore boyfriend and friends ate it all up! It was absolutely delicious. You’ve definitely outdone yourself with this one Isa. I love, love, love it. I’ve never been a fan of scalloped potatoes because they’ve always been too soupy and bland. But I decided to give them a shot because I was hoping you had revolutionized scalloped potatoes, and I absolutely can’t get enough eggplant bacon. Well the combo was ridiculously amazing. The sauce was nice and thick, a real “stick to you bones” meal…thank you so much for being such a rock star in the kitchen! Made this tonight and it is divine, first time I’ve used cashew cream and I love it. Hubby is a meat eater and thought it was the bees knees too. I had similar issues as another post above in not being able to get the “bacon” crisp despite cooking it longer etc but it’s my first time making it AND it will only go soggy in this recipe so not bothered as it tasted awesome. For reference I followed tips from forum and used smoked paprika (half teaspoon) in place of liquid smoke and it worked like a dream (uk impossible place to just buy the smoke). Thanks for another stunning recipe, looking forward to making the pumpkin chocolate loaf and pumpkin cookies (AfR) this weekend. Yum! I made this tonight for dinner and it was so good!! I’ve been struggling to find vegan recipes my husband enjoys but he loved this and went back for seconds! He even told me I can make this again!! Thanks so much! I definitely have to try more of your recipes!!! Isa, you out did yourself on this one. Since I have a wheat allergy I added 2T of super fine brown rice flour to the cashew/veggie broth mix. This recipe rocks. Love the eggplant bacon. Thanks. Thanks for making a gluten free version! I’m sure others will appreciate it. Are you allergic to all nuts? Sunflower seeds, too? Sesame seeds? Pinenuts? Wow. this was awesome!!! We tested it for Thanksgiving, and it is officially on the menu. Most thought it was perfect as is, but my dad thought the sauce was a little too thick, and could be a bit more liquidy (like traditional scalloped potatoes). I may add a bit more almond milk next time I make it… it could be cuz I live in Arizona though, ingredients can get dried out. Also, I was a little unsure about the celery being in this recipe, but it fit well in this dish! Thanks! Just cashews and pistachios, Isa. 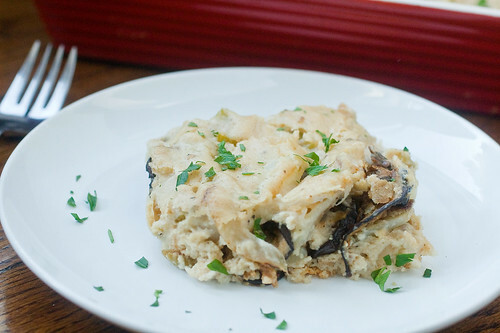 YUM, made this last night for dinner and it was so good (the eggplant bacon is like crack! ), I’m eating the leftovers for breakfast! Next time, were adding some sliced olives and thyme to the cashew sauce for an update to the dish. I’ve been wanting to make scalloped potatoes but was so intimidated! Thank you! This really hit the spot. I have to admit, after prepping the eggplant bacon I wolfed down every piece in record time, so I wasn’t able to include it in the dish. To compensate, I added soy sauce and seitanbacher’s vegetable broth powder to the cream portion of the dish. I used 1 mori nu tofu + 1/2 cup cashews instead of 2 cups cashes, and I also added Kale. 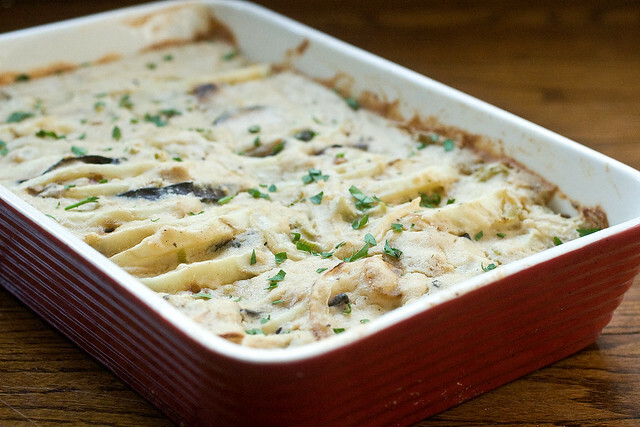 I never liked scalloped potatoes in my pregan days, but I really dug this! Turned out amazing! I followed as is. No changes! Delicious! Soul food! This is the second time I’ve made this recipe now. There are NO leftovers with my family when this is served. This actually tastes much better than the ‘traditional’ way of using cream of mushroom. I’ve made this 3 times already this holiday season. I took it to 2 different potlucks as well as Thanksgiving dinner. Everyone loved it! I made them tonight. DELICIOUS! I agree with Brent – this does taste better than cream of yuck soup. My hubby agrees. Thanks for this recipe! I’ll be making it again. Do you think this would not cook properly if the potatoes were left unpeeled. If unpeeled should it be handled any differently, or cooked any differently? I know this question is late, sorry. Thanks. I prefer the texture of peeled here, but unpeeled would work with no other adjustments. This was so delicious!!! I made it last Friday for dinner, but didn’t have cashews so I used a simple gravy mix (almond milk, earth balance, and flour with some seasonings to add a bit of flavor) and mixed that with the vegetable broth. It worked out well. Had some silken tofu in the fridge that needed using, so 3 tablespoons went into the sauce, and used roasted fennel (mmm!) instead of eggplant. It needed an extra 30 minutes in the oven at 450 F (gas mark 8) – I think I may have packed my potatoes a bit tightly into a smaller casserole dish (also used fewer potatoes). The potatoes were sliced very thinly, but they were standing pretty much up-right to fit in the dish… Will use fewer potatoes next time or invest in a larger casserole. =) I left the potatoes unpeeled and they were great (Sante variety). This recipe satisfies my nostalgia for scalloped potatoes (haven’t had them since I cut out dairy from my diet). The smoky flavor of the eggplant marries perfectly with the creamy texture of the cashews and potatoes so nicely. I LOVE, LOVE, LOVE this recipe. A meat-eating coworker tried it at work the next day and told me, “That’s frickn’ delicious!” I could seriously tuck in to the whole casserole by myself for dinner it’s so tasty. This is a keeper for sure. I had to force myself to eat some greens with it and not just have potatoes for dinner. I must admit I was a bit skeptical at first because this was my first foray into using cashews to make a creamy sauce, but the end result was sooo delicious! I made the eggplant bacon, which added a nice richness to it, but I think it would work equally well without because the recipe is already so flavoursome. I loved this and will certainly be making it again. I went with your encouragement to use this recipe as a template, and used sweet potatoes instead, as well as some broccoli. Next time, I will just use the template. 🙂 I think the sweet potatoes didn’t let the sauce shine enough–when I tasted the sauce before assembling, it made me weak in the knees it was so good. I’ll also just serve the broccoli steamed alongside. Next time!! Are the cashews raw or roasted? Does it matter? I have a hard time finding raw cashers where I live. Making this as soon as I can. SO EXCITED! Made this today for a wedding shower, such a huge hit! Devoured completely by the omni’s. Will be sure to make this for all future get-togethers. Thanks so much for coming up with this recipe and sharing with us. 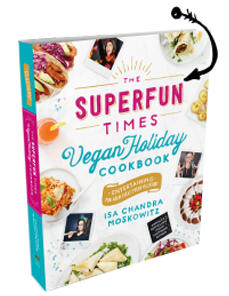 Oy Vegan Top 5 Thanksgiving Recipes! | Oy Vegan! Just made this for my husband’s birthday! He LOVED it. This was excellent!!! I was a bit concerned about the sauce consistency when I realized after adding it to the onion and celery mixture that I never added in the bread crumbs. I toasted them on the side and stirred them in and it turned out well, but maybe a bit thicker than it was supposed to be. Bringing this to Christmas Eve dinner! It would be great if people actually commented AFTER they make recipes. All of the recipes I’ve viewed have very favorable comments, all based on soley the recipe, and not actually preparing and eating the dishes. My friend just made this for Thanksgiving, and gave me some leftovers. WOW, creamy, smoky goodness. This is comfort food for sure, but looks so elegant too- perfect to bring to an omnivore holiday! This was seriously amazing! I made it with half cashews and half sunflower seed because I ran out of cashews, and it was delicious. My husband and I couldn’t stop eating. I love the way the eggplant bacon (I added a splash of maple syrup to my marinade) rehydrated in this and yet had its own texture apart from the potatoes and the creamy sauce. I was worried it would all melt together, but the elements stayed distinct and delicious. The only note I will make for last time is to test the potatoes fully, as we had a few that didn’t cook perfectly, but that was the fault of our oven not the recipe, which is perfection! As I pull up this recipe for the millionth time, I thought I should write a quick comment singing its praises…this is by far my most requested dish and something I make for both thanksgiving and xmas…it’s been known to wow even the most rigid dairy-loving carnivores…delicious! I’ve read this recipe every year for the last four years. I was intimidated and feeling like I could never make it. But I just did! For Thanksgiving. With my best friend. It was so delish. We are so thrilled. I will make it every year. The pan I made tasted like French onion dip! Used panko breadcrumbs, sweet onion and caramalized onion per the recipe. Hmmm.. not sure if that’s what it’s supposed to taste like?? Either way, I still had, like, 12 servings. I have never try something close to this taste!